Criminy! Where does all this stuff come from? Suddenly MacBook’s spacious 512GB solid-state drive has 19GB left, and you start feeling pinched. It’s time to do some easy regular maintenance work! Before you consider buying a new internal or external drive, take the smart step: Sweep your laptop’s drive clean of unnecessary and space-hogging software and temporary files. You can easily delete files. You can move seldom used files and folders to external storage (such as a USB flash drive, an external hard drive, or a DVD) to free up space on your laptop’s internal drive. You can uninstall applications purchased from the App Store using Launchpad — from the Launchpad display, click and hold down the icon until it wiggles. If an X button appears on the icon, you can click the X to remove the application from your MacBook. You can get rid of an unnecessary application by deleting its application folder that was created during the installation process. Always check the application’s README file and documentation for any special instructions before you manually delete any application’s folder! If you created any documents in that folder that you want to keep, don’t forget to move them before you trash the folder and its contents. In fact, some applications may come complete with their own uninstall utility, so checking the README file and documentation may save you unnecessary steps. Right-click the icon and choose Move to Trash. Right-click the Trash icon in the Dock. Choose Empty Trash from the pop-up menu that appears. Some applications install files in different locations across your drive. (Applications in this category include Microsoft Office and Photoshop.) How can you clear out these orphan files after you delete the application folder? Type the name of the application in the Search text box. 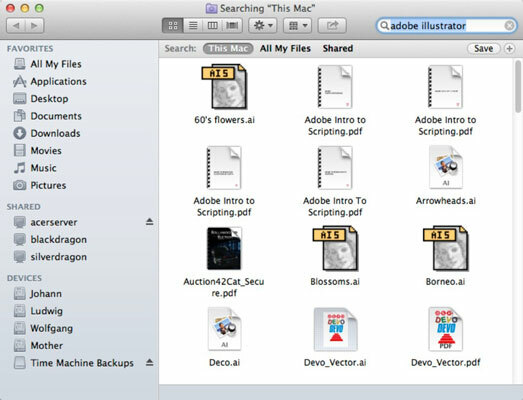 Decide which of these files belong to the to-be-deleted application. Be sure that the files you choose to delete are part of the deleted application. For example, a Keynote presentation with the name Instructions on Building with Adobe might not be part of Adobe Illustrator. In the Search Results window, click the associated file(s) that you want to delete and just drag them to the Trash. Don’t empty the Trash immediately after you delete these files. Wait a few hours or a day. That way, if you realize that you deleted a file that you truly need, you can easily restore it from the Trash. If you’d rather use a commercial application to help you clean up your drive, a number of them are available but most are shareware and perform only one task. For example, Tidy Up! 3 from Hyperbolic Software finds only duplicate files on your drive, matching by criteria such as filename, size, content, and extension. For keeping your MacBook’s drive slim and trim, consider CCleaner for Mac, from Piriform. 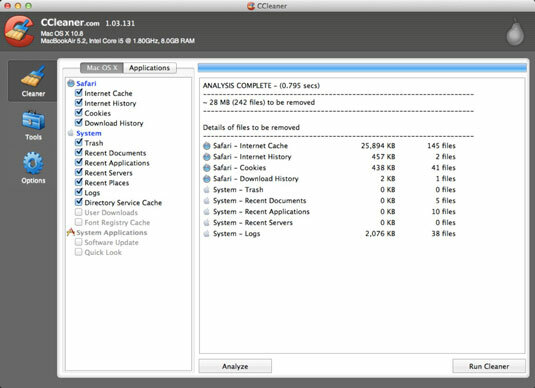 This great utility can clean everything from Internet crud (browser cookies and your surfing history) to the OS X system caches that can grow so doggone huge, and you can easily fine-tune what CCleaner for Mac will remove. The utility can also uninstall many applications for you with a single click.